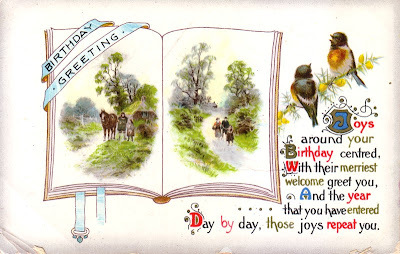 This lovely birthday greetings postcard was designed in England by Wildt & Kray and printed in Bavaria. The postcard bears the distinctive "W&K London" insignia on the reverse of the card and is clearly date stamped 9th April 1912. The gelatin finish is highly glossy and has suffered over the years; unfortunately, as is common with this delicate kind of finish, there is some cracking to the surface and edges.